The 7am queue, Sunday morning at a petrol station in the Austrian alps. 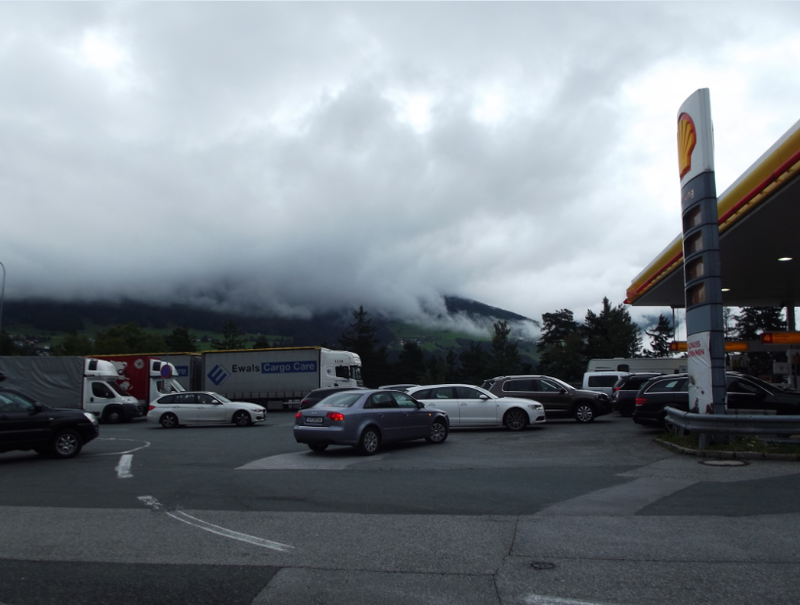 The majority of petrol stations we saw in Austria/Germany were Shell garages. When we were approaching the ferry at Dover, England, I pulled into the petrol station and filled the tank. My OH’s mum had told us confidently that petrol was much cheaper in France. This should have meant waiting until France to fill up, surely? Why, then, was I getting petrol now? Actually, I was deeply worried by particular practicalities of our trip, not least of which, where to actually buy petrol. I didn’t know any of the brand names and was concerned that I wouldn’t be able to find these petrol stations. I’d looked online for a list of company names to look out for (Esso, Shell and even BP have stations abroad), but since no list existed I was limited by searching for the overseas locations of petrol stations I already knew the names of. I’d also searched online to find the names of fuels abroad. I was still deeply worried about running very low on fuel and not being able to find a petrol station. This only happened in Italy, where there were so many different flavours of fuel and colours of hoses that it was rare to find somewhere that carried all of them. The only constant everywhere was diesel, which left me wishing many times that our vehicle was a diesel one. But you got what you got, all you can do is work with what you got. I’m going to tell you what I learned about filling up abroad, and I’ve included a list of names of petrol types (and which engines they go in) for the countries I’ve been to so far. 1. Service stations generally sell fuel at an almost-reasonable price, but it varies wildly. In Northern Italy on the Autostrade (plural of Autostrada, or freeway), they give you the next 3 prices for diesel and “benzina” from which you can work out the relative prices for your chosen fuel if it’s not either of those. 2. Always fill at two bars or quarter of a tank, and always round down when making the decision; every time we looked at the two bars (1/4 tank) and thought “it’s ok, we can shop around for a better price” something always happened that stopped us getting to a petrol station in good time, and we cut it far too close, far too often. We actually skipped quite a few stations on the way down because we didn’t understand which fuel to put into the car (because the Italians have so many) and they all had black, yellow or red pump handles, no green ones. There was the time we suddenly ended up in a 4 hour gridlocked traffic jam around Firenze, in 45 degree heat, watching our petrol dwindle. There was the time we took an A-road (I think they’re “routes” or “interstates” in America – the one that’s the next size down from a freeway??) and our 50 mile route suddenly became 100 miles in the dark on continuous hairpin bends every 30 metres or less, so we constantly were doubling back on ourselves, and that hadn’t been marked on our map as such, cutting across from just below Ravenna to the E1. The scenery around there is apparently stunning, but at 1am, it was dark and we didn’t have enough fuel. Luckily the second half was 50 miles of the same, but downhill, so we just rolled it until we got to the E1, and there was a petrol station within 500m of getting onto the Autostrada. The engine never stopped from lack of fuel, but it came very close a couple of times (making that dreadful hiccuping sound as it gasped for gas). 4. In Rome, most petrol stations are self-service, but there are men who will insist on filling your car for you (they will be on a mobile phone the entire time, and usually smoking as well, we saw many of these) and then harass you for a tip. Unless you’re sure of yourself physically or speak Italian louder than whoever is on the other end of the phone, you just have to give them some money. I consistently gave 2 Euros on a 20 Euro fill, and it did work out cheaper than the manned petrol stations on the ring road. I don’t think these men actually work for any petrol station company, but Rome is a city whose primary workforce are street hawkers, so you just get used to it. 5. In Austria and Germany, many stations have full service pumps and self-serve pumps, and these mean different things to elsewhere. With the full service pumps, you stop your car and tell the attendant how much fuel you want (like in the olden days of good service) and they’ll fill it for you. At the self-serve pumps, you put your own fuel into the car – but with either option, you still have to go inside to pay. They don’t have a pay at the pump option at these stations so either way you’ve got to waste the same amount of time. The full service pumps are usually about 15-20 cents more expensive per litre than the self-serve, which can seriously add up (that’s 1 euro extra every five litres of fuel. Your fuel tank is usually 25 to 30 litres, so service costs 5-6 Euros per complete tank fill). 6. Make sure you have a credit card as well as your money, some pay-at-the-pump self service machines only take cards, and they’re the ones you’ll get stuck with late at night. 7. To use the European pay-at-the-pump petrol stations, you actually don’t pay at the pump you’re using. In the centre of all the pumps, there will be a machine that you have to select options from and prepay for the amount of fuel you’re going to put in your tank. There are usually language options for at least French, German, Spanish, Italian and English, but once you’ve used 3 or 4 of these machines you’ll know the menu options well enough that you won’t need English (unless you really aren’t paying attention). Just follow the menu through to select fuel type and amount to buy, select payment method if it’s an option and give the machine the money. Eventually it’ll let you go back to your pump and fill up. Some of them tell you the price in litres and get you to confirm you are happy with this price before letting you continue. Others just take your money. Once you’re filling up, it will automatically cut off at the amount specified. There isn’t an option with these machines to “fill ‘er up” so you need to guess how much fuel you want to put in. I usually went for 20 Euros because the price per litre was often quite high and I thought that if anything went wrong with the machine I’d only lost 20 Euros. If something does go wrong there isn’t really anything you can do about it because these stations are totally unmanned, so just write it off to experience. 8. Knowing your numbers 1-15 in foreign languages really helps with identifying which pump you’re trying to pay for petrol. In England, you walk into the shop and say “pump number 5” and you do the same thing in foreign countries. Just have the number ready before you go in and they can process your request faster. If you don’t know the numbers of the country you’re in, Europeans often can also do English although it might take them a minute to work out what language you’re speaking in, just like if someone started speaking to you in French at your place of work you’d need to think before responding. 9. Despite my worries, it’s actually really easy to spot petrol stations abroad – because they look like petrol stations. Big roof, booth for paying (usually), sign with prices, petrol pumps. Unless, y’know, you’re really unlucky and end up at a car wash or diner that used to be a petrol station and still has all the trimmings. I think my main worry was needing to look for them on my smartphone which always needed a brand name to search, but since it didn’t have any network at all from Dover onwards, that really wasn’t an issue for me because there were so many roadside petrol stations. 10. As a final hack, none of the petrol we bought in France was anything remotely resembling the prices OH’s mum had found before we left. I hadn’t been holding my breath, but it’s worth bearing in mind that those price comparison tools are not always very up-to-date and it’s probably going to save you time to not bother looking them up, especially if you’re going to be gone drivin’ for more than a day or two. Super Carburant – leaded engines (old 4 star cars) don’t put in unleaded engines. You can carry up to 10 litres of fuel but not aboard ferries. You can carry up to 10 litres of fuel with you, but not aboard ferries. Benzina – generic term, sometimes used for “fuel,” still unsure if this would go in my car. Benzina verde – unleaded engines. GPL (gas di petrolio liquefatto) – LPG engines. No lead replacement available, but you can buy a fuel additive to use with unleaded petrol. Sometimes unleaded is called “senza plombo” but it’s not an official grade of petrol. Over 800 miles of driving in Italy, I only saw SP95-E10 once, and it was far more expensive than anything else they were selling. Bencina – petrol, again nowhere was able to tell me if this was ok to put in an unleaded engine or whether it was a common term for something else. Gasoleo “B” – HEATING OIL ONLY DON’T PUT IN CAR! gasolina sin plomo – Unleaded engines. biogasol – another one that no-one could agree on the meaning of. Most likely biodiesel but might instead be something to fuel houses. Probably best to avoid. SP95-E10 may or may not be available in Spain – it’s likely because it’s a European initiative, but then we don’t have it in the UK, so I will report back when I return from driving to Moroccco. Does anyone have any further experience on the names of unleaded/diesel in other countries? I’d love this to become a reference. Don’t just post website translations because I’m specifically collecting the words printed on the sides of petrol pumps. For example, some Italian dictionaries say “petrolio” means “petrol” but it’s actually never used in the sense that we would mean, because it means “petroleum” like “petroleum jelly” (Vaseline). If you asked for it at a petrol station you would get mocked. So, only contribute what you’ve seen at petrol stations please!